17 nights on Wind Spirit in French Polynesia was the cruise of our lifetime. The ship, food, staff and amenities were perfection, and our clothes were wet with tears having to disembark. The staff literally knock themselves out trying to please and make the experience something you&apos;ll never forget. We chose this because we sailed a 7 day on the original Windsong Tahiti 25 years ago- it was a dream of a cruise then and just as wonderful this time only 10 days longer. We are water people, former divers and long time snorkelers. Figured we&apos;d never tire of being in the water with all but 2 days of 17 in port. We were right. A caveat- this is not a cruise for anyone with a mobility problem. Most of the excursions are for people with a moderate tolerance for physical activity. If you like the water you should be a decent swimmer and moderately good snorkeler, although there are beginner diving excursions. There are a lot of land tours on each island however that work for everyone. Had gorgeous weather. Just two days of rain in 17 days, the rest sunny and spectacular. It is the rainy season though so the humidity was high. We headed to Papeete on Air Tahiti Nui from LAX. The flight was decent even though it was one of their older planes, good food, good service and right on time. I&apos;d pre-reserved a router online with Tahiti Wifi that worked great in port everywhere but Fakarava and Rangiroa. Pick up at the airport in Papeete was easy. We met the B&B proprietor Beni from Fare Suisse right in the pickup point at the airport just as he did last year when we visited. Fare Suisse has simple, but comfy rooms, extremely clean and a nice breakfast. There are 10 rooms and they offer airport pickup and dropoff at the port. Beni and wife Therese could not be nicer more generous people. We visited the market down the street for some toiletries we&apos;d forgotten. There&apos;s an ATM there too. Boarding started about 12-1pm. There was a short line to wait while staff did a manual luggage screening. It was quite cursory though, we had some airline type containers of alcohol and they weren&apos;t found although I saw they&apos;d confiscated some full bottles. Then we were on board that sleek gorgeous ship with a welcome mai tai and off to a beautiful lunch spread in the Veranda. Always several hot dishes, and salads, incredible cheeses and breads and of course the fabulous desserts. There is also a special cooked to order daily, first day was prime rib. Bar service began that first lunch and waiters knew and addressed us by our names from then on. Our cabin was a BX Deck 1, #129. Wonderfully laid out and remarkably designed storage. The bathroom was very comfortable with a roomy shower and nice fixtures. Our cabin attendant Ady was superb. Explored this gorgeous ship for the rest of the afternoon spending most of our time relaxing on a deck chair on the bow. Husband is fond of working out and his only disappointment was the gym- decent equipment but small space. Get 3 people in there and it really heats up. 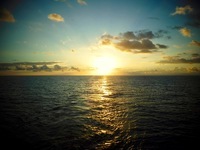 There is yoga and Pilates every morning starting at 7am on the top deck. Dinner in Amphora, as breakfast and lunch, were just remarkable.The variety and consistency were mindblowing. We had the good luck to be booked on a James Beard Foundation cruise with a pastry chef who gave demonstrations every other day. On alternate days there were wine tasting (complimentary!) events. Most we didn&apos;t make due to excursions unfortunately but those who did just raved. Service in Amphora was superb- seemed we never had to wait for a course. The maitre d&apos; gave us the same table for 2 almost every night in the quietest part of the dining room. Although service was so good we&apos;d have been happy with any of the waiters we had. I&apos;d probably choose Adhe as number one though. If I have a complaint it would be that the dining room is very noisy. But the FOOD- unbelievable. Infact Cruise Critic gave Oceania the nod for best luxury line cruise food...our most frequently traveled line is O and we give them a 4.75. We give Windstar a 5. I have to say something about breakfast! First of all as with lunch we could eat out on deck in a covered area looking out at the ocean. There was the usual gorgeous spread, fruits, pastries, to order eggs, bacon, sausage etc but there is a menu to order from too with different selections each day- eggs benedict, raisin brioche french toast, belgian waffles with raspberries and blueberries, flax seed pancakes. Try spoiling us more. Coffee was just ok with a weakness on the cappuccinos and espresso. Good but not delicious. With everything else so drop your socks coffee gets a pass. Was wonderful to wake up at 6am and enjoy the gorgeous mornings with coffee and pastries on a chair overlooking the ocean and the next island we were closing in on. Candles was lovely. We had four nites in Bora Bora and were fortunate to have both our nights in Candles on the overnight in Bora Bora- very calm and peaceful. Could have had more nites in Candles but the food in the dining room was so good it was hard to pass up the nightly selections there. Wine service was excellent, terrific selection with good prices. Cocktails reasonably priced too. Lucked out and had free laundry service for the whole cruise- what a gift. Not only could we pack lighter but everything came back in beautiful shape, even silk shirts and bathing suits. They said pressing was not included but everything looked pressed to me! In before 9am back by 5pm same day. The library had limited inventory as you might expect- bring your kindle. The shop was well stocked for the size of the ship. We aren&apos;t night people but passed through the lounge after dinner and sometimes sat to listen to the two person group softly singing popular tunes. The young woman had a spectacular voice- Time To Say Goodbye and Don&apos;t Cry for Me Argentina were outstanding. The gentleman sat on deck by the pool some afternoons and played softly. The deck party dinner was superb. Food selections and atmosphere were wonderful. As was the dinner on the motu in Bora Bora. The show including the fire dance was phenomenal. The motu day off Tahaa was a nice surprise too. Decent snorkeling, water toys, good lunch, beautiful location. The parts I love the best are the evenings. The sail away. The sails open and ahhhhh. So lovely. And the nights on the bow of the boat. The stars so bright and the moon on the water. Truly magical. One night we were out and one of the officers pinted out the constellations to us. Shore excursions.....did all but two independently. The ship&apos;s tours we took were surprisingly good as they seemed to be with most of the people we spoke with. Just a lot more expensive than independent. Fakarava- one reason I wanted to do this cruise was to do Fakarava. And to tour with the famous Ato. It didn&apos;t work out. He needed 8 people, we only had 6 a few days before the trip and he could not confirm us. So in order to have something we were assured of doing, I booked the Blue Lagoon with the ship. The day before the tour Ato emailed saying he&apos;d take us, but at that late date I had no access to email. He showed up at the dock, but not me not ever thinking it was still on. So he ended up taking just 4 other people at only 75% of the price he quoted me. Not nice and I was sorely disappointed. Those folks said they had one of the best tours they&apos;d ever taken just as I knew it would be. Dang. The Blue Lagoon was pretty good- saw a protected bird motu from a distance and visited the Blue Lagoon. Spectacularly colored water but we spent almost 2 hours just hanging around with a guide who carried on a long convo with some French speaking Canadians while the rest of us sat on a coral mound and watched crabs. We stayed so long there we had very little time to snorkel at Pufuna which would have been the highlight for us. Maybe 10 minutes there to get back to the ship just in time before it departed, and it would have been terrific snorkeling had we been able to stay longer. The excursion was OK but could have been better. Rangiroa- independent drift snorkel and the Aquarium. Very exciting. You need to be a good snorkeler. The day we were there the current was moving fast. You jump in and the current takes you past tons of fish while holding onto a small raft behind your guide. There&apos;s really not time to stop to adjust your mask so you have to be READY! A good reason to bring your own snorkel equipment so you know everything fits and works for you. We had three runs one of which was a mile long and marvelous. Afterwards we visited the aquarium with tons of fish, big moray and resting big nurse shark. Tahaa- the Coral Garden with the ship. It was terrific. Beautiful 30 min. boat ride with about 6 others to a gorgeous channel between motus. You get out of the boat and walk to the site where you begin your drift snorkel with water shoes carrying your fins(Yes bring water shoes. Neoprene gloves and pants or tights and rash guard too to cover body. Very sharp coral on this tour and we saw lots of injuries. You can find this stuff on Amazon for next to nothing) Then entering the water with your fins (with lots of direction!) you sail down a channel lined with coral seeing some gorgeous sealife. It was some of the best snorkeling I&apos;ve ever done. This is not to be missed. Your guides will help you along the way. If the water is flowing fast it&apos;s a lot harder to stay on course but your guides will nearly pick you up and redirect your body. The water is very shallow- you can stand up. Everyone has to do this! It&apos;s one of the most incredible snorkeling sites we&apos;ve ever done. At the very minimum pack water shoes. Mine were $12 on Amazon. Bora Bora- had 4 days there and did 3 different tours. The very best was Tohora Bora Bora. I was not expecting it to be so wonderful having added it on at the last minute. The guide Simon was fantastic. Exuberant, excited about teaching about his lagoon and island, and this was all about snorkeling with dolphins, manta rays, eagle rays, stngrays, sharks and a coral garden with the clearest water I&apos;ve ever seen. We were wowed not just by the scenery but also by a guide who was truly mesmerized still by his environment after living in Bora Bora for 20 years. If your go May through October he will take you to see whales! We also did Pure Snorkeling and Lagoon Service and while they were very good they were not quite as good as Tohora Bora Bora. Pure Snorkeling brought us to most of the same sites as Tohora did but the guide was very quiet while a very sweet guy. The guide at Lagoon Service was a little impatient with a few of the slower people on the boat telling them to hurry up while trying to get up on the ladder. It&apos;s not easy for new snorkelers to get in and out of a boat. Then they brought us to their gorgeous private motu for lunch. Everything was fine until we the time kept passing and we realized it had been 2 hours since we&apos;d seen our guide. Thought that he was ready to bring us back to the ship about 2:30 until they brought out another guy who wanted to show us how to open a coconut. He loved to TALK and that went on for 45 minutes! The tour is great but just do the morning tour- no lunch. I should add that in the morning they brought us to the open ocean and we snorkeled with lemon sharks. It was worth it just for that. Moorea- jet ski with Moorea Activities Center. A blast! Exceedingly nice family company. We went most of the way around the island. My husband is a fast but terrible driver. Midway he told me "I can&apos;t see a thing!". We snorkeled about 3 sites and ended up in a shallow area full of stngrays. They are so sweet and loving. Like amorous cats. Do this. It was only $185 for 2 people. Ship was charging $399. The company picks you up right on time at the dock. Mid-cruise we stopped in Papeete as the 10 day part of the cruise ended and the 7 day began so we picked up more passengers. We took the ferry back to Moorea (easy) for a day stay at the Hilton Moorea. $90pp for all day, use of pool and beach and toys and fabulous lunch. Terrific snorkeling. Used Torea Nui Transport in Moorea- right on time. Another family outfit- nice people and they do island tours too. Reasonable. There are tons of stray dogs in Tahiti as there are all over the world. Tahitians don&apos;t believe in spay/neuter either. So lots of skinny, sad dogs but especially so in Moorea. A few are owned but most are free. There were lot of us buying food at grocery stores feeding along the way. It&apos;s heartbreaking. Our next day in Moorea we&apos;d planned to rent a car and go to the Lagoonarium, but it rained very heavily all day so we returned the car early and went back to the ship. Raiatea- wow, another amazing day. We did L&apos; Excursion Bleue with Bruno. Fabulous. He has a boat that accommodates 12 people but he&apos;d just booked the two of us. Instead of canceling he took just the two of us around the whole island of Tahaa snorkeling- same tour as he does with the big groups probably at a loss to him. He&apos;s a sweet man. 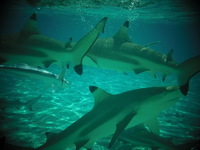 First place we stopped was teeming with sharks- there must have been 50 at least. We swam with them all around us and stingrays floating around too. The nicest thing was that he seemed in no hurry- he&apos;d let us stay in the water wherever we stopped as long as we wanted. Another stop to snorkel and then a vanilla and pearl farm. Could have done without those but they were brief and no pressure to buy at all. Another snorkel stop and then back to the Coral Garden drift which we&apos;d done before. We were so happy to be returning as it is so spectacular. He was a much better guide this time too. Huahine- another day with Sailing Huahine Voile. Did this last year. A beautiful sailing boat for 12 moored in Fare right off the dock where tender arrives. There were just 4 of us and it was a lovely day. Two snorkel sites with lots of background history and explanation of sealife. Again lunch a little too long and it&apos;s bring your own from the local market. Huahine is probably my favorite island. Very unspoiled. The couple who operate the boat are characters- a lot of fun. 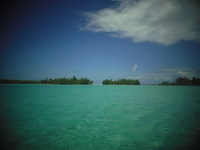 If it were possible we would have done Ile Aux Recifs in Rangiroa with Leon. They have a 6 passenger minimum. By the time I got the 6 together I stopped getting emails from them. But give it a try- it&apos;s supposed to be wonderful. revaultleon@mail.pf Sorry so long. But just returned last night and still coming off the high of all this. Everyone who has the means and the physical ability needs to do this. It&apos;s hard to describe how magnificent this cruise is. Just do it. 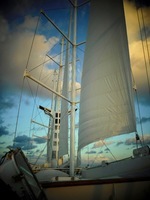 17 nights on Wind Spirit in French Polynesia was the cruise of our lifetime. The ship, food, staff and amenities were perfection, and our clothes were wet with tears having to disembark. The staff literally knock themselves out trying to please and make the experience something you&apos;ll never forget. We chose this because we sailed a 7 day on the original Windsong Tahiti 25 years ago- it was a dream of a cruise then and just as wonderful this time only 10 days longer. We are water people, former divers and long time snorkelers. Figured we&apos;d never tire of being in the water with all but 2 days of 17 in port. We were right. A caveat- this is not a cruise for anyone with a mobility problem. Most of the excursions are for people with a moderate tolerance for physical activity. If you like the water you should be a decent swimmer and moderately good snorkeler, although there are beginner diving excursions. There are a lot of land tours on each island however that work for everyone. Had gorgeous weather. Just two days of rain in 17 days, the rest sunny and spectacular. It is the rainy season though so the humidity was high. We headed to Papeete on Air Tahiti Nui from LAX. The flight was decent even though it was one of their older planes, good food, good service and right on time. I&apos;d pre-reserved a router online with Tahiti Wifi that worked great in port everywhere but Fakarava and Rangiroa. Pick up at the airport in Papeete was easy. We met the B&B proprietor Beni from Fare Suisse right in the pickup point at the airport just as he did last year when we visited. Fare Suisse has simple, but comfy rooms, extremely clean and a nice breakfast. There are 10 rooms and they offer airport pickup and dropoff at the port. Beni and wife Therese could not be nicer more generous people. We visited the market down the street for some toiletries we&apos;d forgotten. There&apos;s an ATM there too. Boarding started about 12-1pm. There was a short line to wait while staff did a manual luggage screening. It was quite cursory though, we had some airline type containers of alcohol and they weren&apos;t found although I saw they&apos;d confiscated some full bottles. Then we were on board that sleek gorgeous ship with a welcome mai tai and off to a beautiful lunch spread in the Veranda. Always several hot dishes, and salads, incredible cheeses and breads and of course the fabulous desserts. There is also a special cooked to order daily, first day was prime rib. Bar service began that first lunch and waiters knew and addressed us by our names from then on. Our cabin was a BX Deck 1, #129. Wonderfully laid out and remarkably designed storage. The bathroom was very comfortable with a roomy shower and nice fixtures. Our cabin attendant Ady was superb. Explored this gorgeous ship for the rest of the afternoon spending most of our time relaxing on a deck chair on the bow. Husband is fond of working out and his only disappointment was the gym- decent equipment but small space. Get 3 people in there and it really heats up. There is yoga and Pilates every morning starting at 7am on the top deck. Dinner in Amphora, as breakfast and lunch, were just remarkable.The variety and consistency were mindblowing. We had the good luck to be booked on a James Beard Foundation cruise with a pastry chef who gave demonstrations every other day. On alternate days there were wine tasting (complimentary!) events. Most we didn&apos;t make due to excursions unfortunately but those who did just raved. Service in Amphora was superb- seemed we never had to wait for a course. The maitre d&apos; gave us the same table for 2 almost every night in the quietest part of the dining room. Although service was so good we&apos;d have been happy with any of the waiters we had. I&apos;d probably choose Adhe as number one though. If I have a complaint it would be that the dining room is very noisy. But the FOOD- unbelievable. Infact Cruise Critic gave Oceania the nod for best luxury line cruise food...our most frequently traveled line is O and we give them a 4.75. We give Windstar a 5. I have to say something about breakfast! First of all as with lunch we could eat out on deck in a covered area looking out at the ocean. There was the usual gorgeous spread, fruits, pastries, to order eggs, bacon, sausage etc but there is a menu to order from too with different selections each day- eggs benedict, raisin brioche french toast, belgian waffles with raspberries and blueberries, flax seed pancakes. Try spoiling us more. Coffee was just ok with a weakness on the cappuccinos and espresso. Good but not delicious. With everything else so drop your socks coffee gets a pass. Was wonderful to wake up at 6am and enjoy the gorgeous mornings with coffee and pastries on a chair overlooking the ocean and the next island we were closing in on. Candles was lovely. We had four nites in Bora Bora and were fortunate to have both our nights in Candles on the overnight in Bora Bora- very calm and peaceful. Could have had more nites in Candles but the food in the dining room was so good it was hard to pass up the nightly selections there. Wine service was excellent, terrific selection with good prices. Cocktails reasonably priced too. Lucked out and had free laundry service for the whole cruise- what a gift. Not only could we pack lighter but everything came back in beautiful shape, even silk shirts and bathing suits. They said pressing was not included but everything looked pressed to me! In before 9am back by 5pm same day. The library had limited inventory as you might expect- bring your kindle. The shop was well stocked for the size of the ship. We aren&apos;t night people but passed through the lounge after dinner and sometimes sat to listen to the two person group softly singing popular tunes. The young woman had a spectacular voice- Time To Say Goodbye and Don&apos;t Cry for Me Argentina were outstanding. The gentleman sat on deck by the pool some afternoons and played softly. The deck party dinner was superb. Food selections and atmosphere were wonderful. As was the dinner on the motu in Bora Bora. The show including the fire dance was phenomenal. 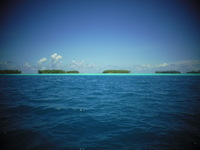 The motu day off Tahaa was a nice surprise too. Decent snorkeling, water toys, good lunch, beautiful location. The parts I love the best are the evenings. The sail away. The sails open and ahhhhh. So lovely. And the nights on the bow of the boat. The stars so bright and the moon on the water. Truly magical. One night we were out and one of the officers pinted out the constellations to us. Shore excursions.....did all but two independently. The ship&apos;s tours we took were surprisingly good as they seemed to be with most of the people we spoke with. Just a lot more expensive than independent. Fakarava- one reason I wanted to do this cruise was to do Fakarava. And to tour with the famous Ato. It didn&apos;t work out. He needed 8 people, we only had 6 a few days before the trip and he could not confirm us. So in order to have something we were assured of doing, I booked the Blue Lagoon with the ship. The day before the tour Ato emailed saying he&apos;d take us, but at that late date I had no access to email. He showed up at the dock, but not me not ever thinking it was still on. So he ended up taking just 4 other people at only 75% of the price he quoted me. Not nice and I was sorely disappointed. Those folks said they had one of the best tours they&apos;d ever taken just as I knew it would be. Dang. The Blue Lagoon was pretty good- saw a protected bird motu from a distance and visited the Blue Lagoon. Spectacularly colored water but we spent almost 2 hours just hanging around with a guide who carried on a long convo with some French speaking Canadians while the rest of us sat on a coral mound and watched crabs. We stayed so long there we had very little time to snorkel at Pufuna which would have been the highlight for us. Maybe 10 minutes there to get back to the ship just in time before it departed, and it would have been terrific snorkeling had we been able to stay longer. The excursion was OK but could have been better. Rangiroa- independent drift snorkel and the Aquarium. Very exciting. You need to be a good snorkeler. The day we were there the current was moving fast. You jump in and the current takes you past tons of fish while holding onto a small raft behind your guide. There&apos;s really not time to stop to adjust your mask so you have to be READY! A good reason to bring your own snorkel equipment so you know everything fits and works for you. We had three runs one of which was a mile long and marvelous. Afterwards we visited the aquarium with tons of fish, big moray and resting big nurse shark. Tahaa- the Coral Garden with the ship. It was terrific. Beautiful 30 min. boat ride with about 6 others to a gorgeous channel between motus. You get out of the boat and walk to the site where you begin your drift snorkel with water shoes carrying your fins(Yes bring water shoes. Neoprene gloves and pants or tights and rash guard too to cover body. Very sharp coral on this tour and we saw lots of injuries. You can find this stuff on Amazon for next to nothing) Then entering the water with your fins (with lots of direction!) you sail down a channel lined with coral seeing some gorgeous sealife. It was some of the best snorkeling I&apos;ve ever done. This is not to be missed. Your guides will help you along the way. If the water is flowing fast it&apos;s a lot harder to stay on course but your guides will nearly pick you up and redirect your body. The water is very shallow- you can stand up. Everyone has to do this! It&apos;s one of the most incredible snorkeling sites we&apos;ve ever done. At the very minimum pack water shoes. Mine were $12 on Amazon. Bora Bora- had 4 days there and did 3 different tours. The very best was Tohora Bora Bora. I was not expecting it to be so wonderful having added it on at the last minute. The guide Simon was fantastic. Exuberant, excited about teaching about his lagoon and island, and this was all about snorkeling with dolphins, manta rays, eagle rays, stngrays, sharks and a coral garden with the clearest water I&apos;ve ever seen. We were wowed not just by the scenery but also by a guide who was truly mesmerized still by his environment after living in Bora Bora for 20 years. If your go May through October he will take you to see whales! We also did Pure Snorkeling and Lagoon Service and while they were very good they were not quite as good as Tohora Bora Bora. Pure Snorkeling brought us to most of the same sites as Tohora did but the guide was very quiet while a very sweet guy. The guide at Lagoon Service was a little impatient with a few of the slower people on the boat telling them to hurry up while trying to get up on the ladder. It&apos;s not easy for new snorkelers to get in and out of a boat. Then they brought us to their gorgeous private motu for lunch. Everything was fine until we the time kept passing and we realized it had been 2 hours since we&apos;d seen our guide. Thought that he was ready to bring us back to the ship about 2:30 until they brought out another guy who wanted to show us how to open a coconut. He loved to TALK and that went on for 45 minutes! The tour is great but just do the morning tour- no lunch. I should add that in the morning they brought us to the open ocean and we snorkeled with lemon sharks. It was worth it just for that. Moorea- jet ski with Moorea Activities Center. A blast! Exceedingly nice family company. We went most of the way around the island. My husband is a fast but terrible driver. Midway he told me "I can&apos;t see a thing!". We snorkeled about 3 sites and ended up in a shallow area full of stngrays. They are so sweet and loving. Like amorous cats. Do this. It was only $185 for 2 people. Ship was charging $399. The company picks you up right on time at the dock. Mid-cruise we stopped in Papeete as the 10 day part of the cruise ended and the 7 day began so we picked up more passengers. We took the ferry back to Moorea (easy) for a day stay at the Hilton Moorea. $90pp for all day, use of pool and beach and toys and fabulous lunch. Terrific snorkeling. Used Torea Nui Transport in Moorea- right on time. Another family outfit- nice people and they do island tours too. Reasonable. There are tons of stray dogs in Tahiti as there are all over the world. Tahitians don&apos;t believe in spay/neuter either. So lots of skinny, sad dogs but especially so in Moorea. A few are owned but most are free. There were lot of us buying food at grocery stores feeding along the way. It&apos;s heartbreaking. Our next day in Moorea we&apos;d planned to rent a car and go to the Lagoonarium, but it rained very heavily all day so we returned the car early and went back to the ship. Raiatea- wow, another amazing day. We did L&apos; Excursion Bleue with Bruno. Fabulous. He has a boat that accommodates 12 people but he&apos;d just booked the two of us. Instead of canceling he took just the two of us around the whole island of Tahaa snorkeling- same tour as he does with the big groups probably at a loss to him. He&apos;s a sweet man. First place we stopped was teeming with sharks- there must have been 50 at least. We swam with them all around us and stingrays floating around too. The nicest thing was that he seemed in no hurry- he&apos;d let us stay in the water wherever we stopped as long as we wanted. Another stop to snorkel and then a vanilla and pearl farm. Could have done without those but they were brief and no pressure to buy at all. Another snorkel stop and then back to the Coral Garden drift which we&apos;d done before. We were so happy to be returning as it is so spectacular. He was a much better guide this time too. Huahine- another day with Sailing Huahine Voile. Did this last year. A beautiful sailing boat for 12 moored in Fare right off the dock where tender arrives. There were just 4 of us and it was a lovely day. Two snorkel sites with lots of background history and explanation of sealife. Again lunch a little too long and it&apos;s bring your own from the local market. Huahine is probably my favorite island. Very unspoiled. The couple who operate the boat are characters- a lot of fun. Sorry so long. But just returned last night and still coming off the high of all this. Everyone who has the means and the physical ability needs to do this. It&apos;s hard to describe how magnificent this cruise is. Just do it.